Over the past number of weeks, we have been travelling to various parts of New Brunswick and we’ve had the privilege of gathering for worship on Sunday mornings with some amazing people. 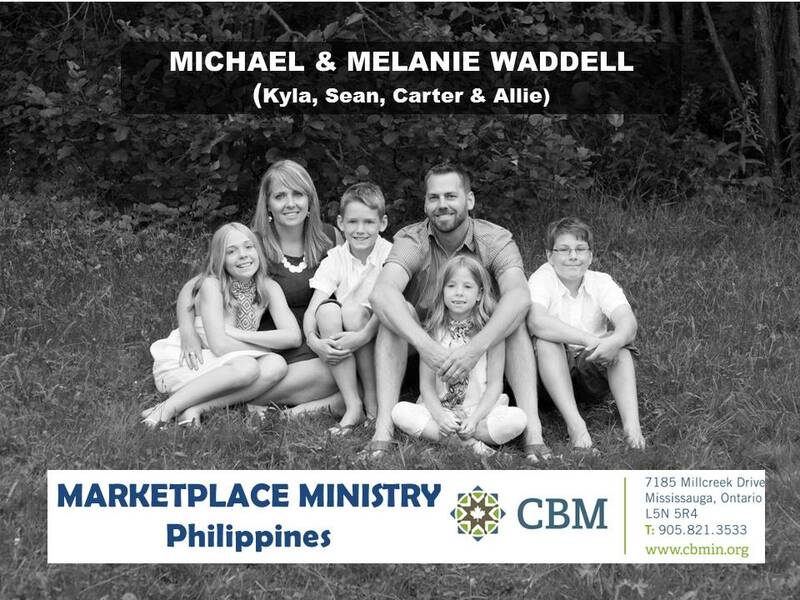 In each of these places we have been given the opportunity to share about our upcoming work in the Philippines with CBM. We have been overwhelmed by the support and encouragement we have received as a family at each stop. Earlier this week, I (Michael) had the opportunity to travel to Prince Edward Island with Randy Stanton (CBM Atlantic Regional Rep.) to meet with various pastors and church leaders at a number of our Canadian Baptist churches. In each of these meetings, we heard stories about the various ways that churches are engaging with God’s mission at home and around the world. It was so encouraging to listen as each one shared with us from their hearts about the many ways their churches had been involved in missions with Canadian Baptist Ministries. For example, on Monday evening we met with a group of women from First Baptist Church Charlottetown. This group of seven women are participating in a Short-term Mission trip to Cuba with CBM this coming March. Randy led them in an orientation session where we had the opportunity to hear each of them share why they felt called to go on this trip and how they hoped and prayed that God would use them as they served alongside our CBM partners in Cuba. Some of the women had been on STM’s before while for others this will be a first time experience. Regardless, God will use this experience to work in each of their lives. Melanie and I know full well from our own experiences the transformation that can occur as a result of an STM experience as God uses the experience to accomplish His purposes. If you haven’t taken part in a short-term mission trip (or even if you have) you should check out the opportunities with CBM for the coming year/s by clicking here. On Tuesday, we heard from a pastor who shared that their church was really passionate about helping overseas when a crisis (such as famine or drought) or natural disasters (such as typhoons or earth quakes) strike like they have in places like Haiti, or the Philippines. Some churches get involved by sending financial resources to assist with the needs on the ground, while others send teams of people to help with the work of rebuilding homes and communities. We heard from another pastor who talked about how they love to get involved with special projects & campaigns such as She Matters Too (click here to learn more) and/or Solidarity Sunday. Another pastor shared how their church took up a special offering on Christmas Eve in support of the CBM Gift Catalogue; they were able to share their financial resources to help those in need around the world. And we also heard from some of the pastors that their churches have appreciated the teaching resources, such as Kids Care, that CBM produces to aid churches in teaching children about missions. Lastly, many of them shared about how their churches loved to support Global Field Staff (GFS) as Partners-in-Mission because of the connection that it gave them to the hands on ministry happening in various countries around the world; by partnering with Global Field Staff they are an important partner of the ministry and feel a strong connectedness to the work going on in the field. We will be continuing our travel throughout the Maritime provinces in the weeks and months to come. We are scheduled to speak at churches each Sunday (with the exception of Easter) up until mid-May at this point as well as a number of WMS groups during weekdays. If you’re interested to see where we’ll be each Sunday please check out our calendar. We continue to be overwhelmed by the support of CABC churches and individuals and look forward to crossing paths with many of you as we continue on our journey. As we mentioned earlier, we are only able to follow God’s call on our lives with the prayers and financial support of generous churches and individuals across Atlantic Canada. However, we have not yet reached our fundraising goal and are still in need of church and individual Partners-in-Mission. If you are interested or would like more information please let us know and we’d love to share more with you. If you are planning to financially support us please let CBM know by simply contacting Barb Keys at bkeys@cbmin.org (or you can give online by clicking here). Even if you are not ready to send in your donation yet, please let CBM know, as this will help us reach the necessary fundraising goals required for further orientation and preparation before departure. All donations of $10.00 or more will receive a charitable tax receipt at year end.